Consumer demand is creating rapid growth in the functional foods market - a market soon to reach $20 billion worldwide. As a result, the food industry has stepped up the development of functional lipids. These lipids impart health benefits when consumed and also impact food product functionalities. While many books have touched on the correlation between dietary lipids and health, there has not been a single-source guide specifically devoted to functional lipids - until now. The Handbook of Functional Lipids is a comprehensive reference that illustrates the science and applications of lipids in foods. The editor has divided the text into four parts for easy reference regarding topics that: explore the isolation, production, and concentration of functional lipids; explain how lipids provide food functionality; determine how lipids are engaged in health and nutritional functionality; and examine the role of biotechnology in functional lipids and discern their market potential. These sections synthesize the collaborative efforts of international experts at the forefront of lipid science and technology. 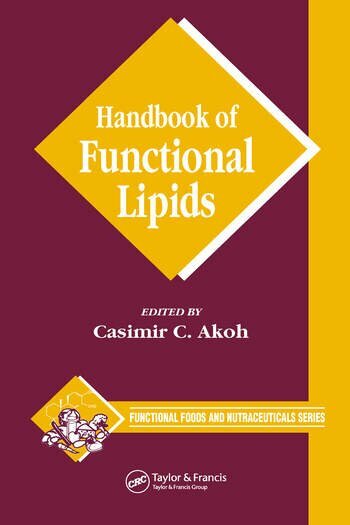 They provide in-depth treatment for each subject in a straightforward and easy to read manner, making the Handbook of Functional Lipids a must-have resource for those interested in this rapidly growing field. Gamma-Linolenic Acid: Purification and Functionality, Udaya N.
Solvent Extraction to Obtain Edible Oil Products, Phillip J.
Dietary Lipids: Metabolism and Physiological Functions, A.